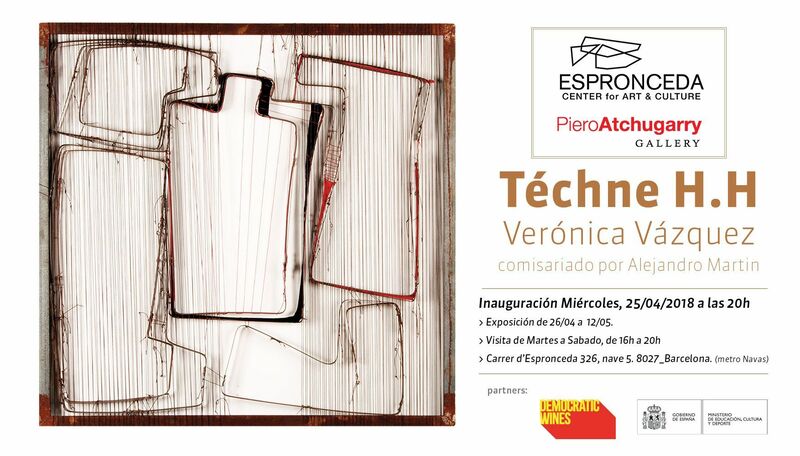 An exhibition of the acclaimed Uruguayan sculpture Verónica Vázquez curated by Alejandro Martin, in collaboration with Piero Atchugary. Espronceda, Center for Art & Culture and Piero Atchugarry gallery, is pleased to present the first exhibition of the Uruguayan artist Verónica Vázquez in Barcelona. The exhibition “Téchné H.H” is a humanistic melody, which is reborn from elements manufactured and conceptualized by man. In Greek, the word Téchné means both technique and art. The work of Verónica Vázquez is nourished by that ambivalence, she creates her art from the remains of objects, machines, artificial materials and human codes, puts them in tune through three-dimensional structures, which draw us and show other realities, functions and emotions. We are in the digital age, currently 5.0, dominated by very sophisticated logical algorithms and a perception of reality through bright screens, brightness and high resolution. However, Veronica proposes an era of Humans with Humans, H.H. concepts such as line, space and reticule. In the work of the image we can clearly see the universe and language of the artist, between poetic composition, resonance of materials and new language, although taking the extreme the image we can say that it is a sophisticated motherboard, a hardware not yet invented , of an artificial and human intelligence through which software flows, a free code, that connects emotionally with the most human and natural of the sophisticated animal that we are. The work of Verónica Vázquez has its resonances with Barcelona, with artists that have marked the personality and sensitivity of the city, from the poetic compositions of Joan Brossa, to the pictorial collages of Antoni Tàpies, through the process of accumulation and organization of Ignasi Aballí. 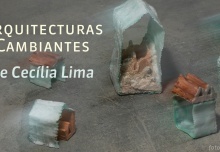 It also connects with a new generation of artists from the city who reuse the remains of objects and materials, which they collect, to generate their artistic pieces. Such like David Bestué, Patricia Dauder and Jordi Mitjà. That return to the human, which the artist proposes, induces us to reflect on our contemporaneity, as the insatiable technology and in its obsession to defeat nature, transforms and destroys it, contaminates with its industrial processes and in a rampant market of consumption, generates more and more waste. However, new contemporary initiatives want to return to a circular economy, which is an intrinsic concept in Veronica’s work. Techne H.H, offers us that experience, reflection and melodic energy at the Espronceda Center in Barcelona. Born in 1970, in the department of Treinta y Tres (Uruguay), Verónica Vázquez studied Drawing, Painting, Sculpture, Engraving, Ceramics, Tapestry and History of Art. She frequented the Pablo Atchugarry Foundation where she was in contact with its founder, Pablo Atchugarry. This experience allowed him to meet teachers such as Octavio Podestá, Henrique Broglia, Miguel Ángel Battegazzore and Wifredo Díaz Valdéz, important figures of Uruguayan art. An important step of his studies was his course in History and Theory of Art, by the artist Miguel Ángel Battegazzore, and the Sculpture Workshop with Luis Robledo in the “Casa de la Cultura” in Maldonado, Uruguay. He completed more studies of ceramics in Buenos Aires, with the potter Jorge Fernández Chiti. Through a process of searching and collecting materials, Vázquez recovers discarded objects to create visually stunning sculptures and wall reliefs. His work makes reference both to the history of Uruguayan constructivism and to the legacy of Italian Povera art. In 2014, the Piero Atchugarry gallery began to represent their work, immediately organizing an individual exhibition in 2014 and another one in 2015. Subsequently, the gallery published a monographic catalog of its work. In September 2015, his work was exhibited at the foundation “Amore e Scelta” Abbazia di Rosazzo, Udine (Italy). In March 2016, the art historian Luciano Caprile organized an individual exhibition of his work at the Commenda di Pré Museum in Genoa. In April 2016, the curator Luca Tomiò selected her work Moldes, to be included in the exhibition Paradiso Inclinato in the Ex Dogana of Rome, together with works by masters such as Alighiero Boetti, Gino De Dominicis, Tano Festa, Jannis Kounellis, Pier Paolo Calzolari, Luigi Ontani, Giulio Paolini, Mario Schifano, Miguel Angel Pistoletto, Emilio Prini and Cesare Tacchi. In May 2016, his work was exhibited in the collective exhibition “Love and Choice” at the MIIT Museum in Turin. In November, the National Museum of Visual Arts of Montevideo made an important retrospective of his work. In 2017 Vázquez participated in “The Hidden Dimensions II”, a collective exhibition curated by Ilaria Bignotti at Marignana Arte, Venice, during the Biennial. The same year he had solo exhibitions at Marignana Arte in September. In December of 2017, the Efrain Lopez Gallery, Chicago, held Vazquez’s first solo exhibition in the United States. His works of art are in private collections in Uruguay, Argentina, Brazil, Canada, Italy and the United States, as well as in public collections such as the Buckhorn Sculpture Park (USA), The Pablo Atchugarry Foundation (Uruguay) and the Museum National of Visual Arts (Uruguay). Located in Pueblo Garzón, Uruguay, Piero Atchugarry is a contemporary art gallery that operates in the primary and secondary markets. The gallery was founded in September 2013 with an exhibition composed of post-war Italian art. 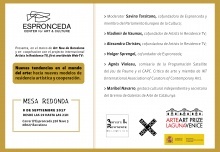 On January 5, 2014, the gallery moved to a larger space in Garzón, occupying an old converted stable. This location represents an interesting challenge to show contemporary art due to the architecture of the gallery. In December 2013, the gallery began a residential program. Artists from around the world are invited to regenerate and create specific works of art inspired by the calm and beauty of the Uruguayan landscape and nature. 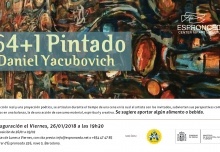 To date, the following artists have participated in this program: Raffaele Rossi (Italy, born in 1958), Daniel Papaleo (Argentina, born in 1968) and Humberto Cazorla (Venezuela, born in 1953), Octavio Podestá (Uruguay, born in 1929), Diego Santurio (Uruguay, 1977), Peter Schwickerath (Germany, 1942), Luca Benites (Brazil, 1981) and Verónica Vazquez (Uruguay, 1970). The program aims to educate the public about artistic processes by converting the gallery into an artist studio. Visitors can come and explore on-site artistic practices, as well as meet and exchange ideas with artists. Each visiting artist develops a project in Garzón and creates a specific installation for the site or for the sculpture park of 22 hectares (54 acres) that surrounds the gallery, leaving a permanent memory of its passage. By December 2018, the gallery will open a second location, expanding in the United States and occupying a 1000 square meter warehouse at 5520 NE 4th Avenue in the heart of Little Haiti, Miami. This next artistic area will be an exciting place to promote international contemporary art and to boost the professional career of emerging and established artists. Art Commissioner based in Barcelona, develops his activity at international level. He has a degree in Art and a Master’s Degree in Production and Artistic Research from the University of Barcelona, curatorial studies / cultural management at Sotheby’s Institute London and Node Center Berlin. At the Espronceda Art Center he has curated several exhibitions, among which: “Burbujas de Ocio”, several Catalan artists; “In one breath” Ernesto Cánovas, “What do you say?” Römer + Römer. He has organized several conferences on contemporary art and collecting: “Mecenet Talk”. He previously curated several exhibitions in the city of Barcelona and in international fairs. He currently directs and curates the “Act Utopia Lab” project for Espronceda, where artists, scientists, technologists and entrepreneurs work together to produce disruptive innovation for social and business purposes. He was recently invited to join the MACBA Foundation.